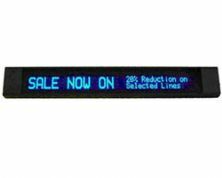 These high quality bright blue eye catching VFD Message Displays provide a high quality display for use in point of sale, receptions, public information and production environments. This premium range product features the latest surface mount LED technology and can be used as either a two line display with 40mm characters or by combining 2 lines together you can have a single line of 50mm or 80mm high characters. 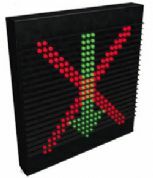 Tri Colour 2 Line Moving Message Board Tri colour twin line moving message board, The product features eye catching text and graphics, 16 x 128 dots resolution, 122 x 976 mm active area. The design of this display assumes that the default status is for the Red Cross to be displayed and switches to Green Arrow as required when the volt free contacts are made. There will never be a Blank Display. Tri Colour 2 Line Moving Message Board Tri colour twin line moving message board. The product features eye catching text and graphics. Red / Green / Amber colours, 120mm single line or 54mm bi line character heights. 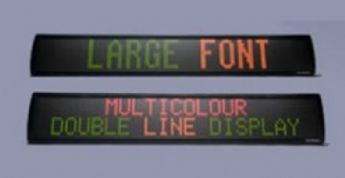 Red / Green / Amber colours, 76mm single line or 37mm bi line character heights. 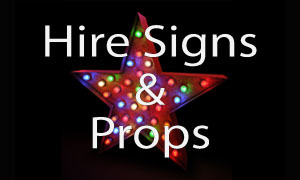 The Turbo LED signs are designed to use at outdoors to be seen in daylight or in sunlight. 2 different colours. 3 different sizes. 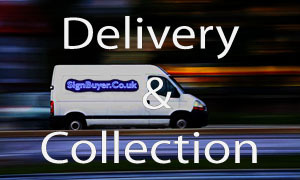 The Turbo LED signs are designed to use at outdoors to be seen in daylight or in sunlight. Tri - colours. 3 different sizes. 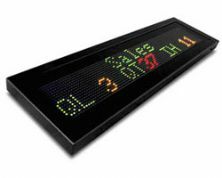 The Turbo LED signs are designed to use at outdoors to be seen in daylight or in sunlight. 54mm or 120mm Font Height. 2 different colours. 3 different sizes. 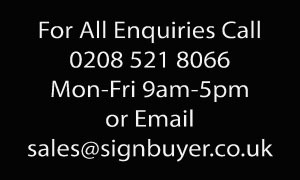 The Turbo LED signs are designed to use in windows to be seen in daylight or in sunlight. Single line 54mm Font Height or Bi line 120mm Font Height. 5 different colours. 2 different sizes.